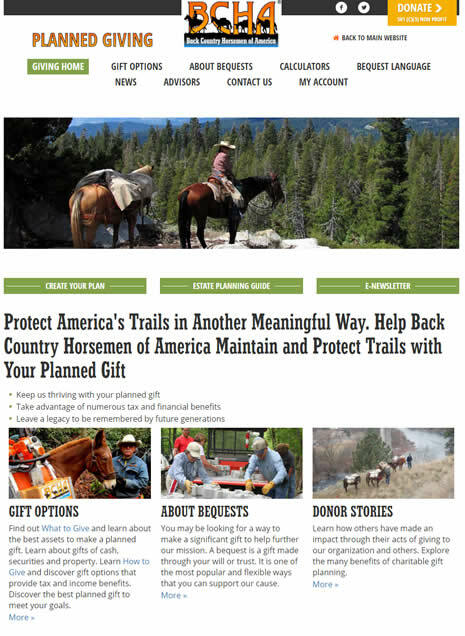 The Back Country Horsemen of America is proud to introduce a Gift Legacy program for its members. This new program enables members and non-members alike to bequest a gift through a will or annuity to help BCHA fulfill its mission of truly Keeping America’s Trails Open Forever. We all know too well the enormous challenges facing BCHA —ranging from the selling of America’s Public Lands, lack of federal trails funding, adequate trails maintenance, and LNT training. Perhaps the most challenging issue is bringing youth into our membership. We are nowhere able to compete for the funding and sponsorship’s of our fellow trail users, the hikers, mountain bikers and off-road vehicle folks. Along with providing a means to give to BCHA, our new site will educate you on how best to leave a legacy for your family. Kids and grand-kids come first, but having wild, unspoiled places for them to visit may also be a priority for you. Visit our new site www.bchalegacy.org and learn the next steps to taking care of your family’s future and considering how you might provide for their enjoyment of our beautiful country.